Japan released Economy Watchers Sentiment, Consumer Confidence, and Current Account and the US will publish Factory Orders m/m. The support rests at 111.230 with resistance at 111.610 which the weekly pivot point at 111.450 is located in between the lines. The EMA of 10 is moving with bullish bias in the ascendant channel and it is above the EMA of 200 and the EMA of 100. The RSI is moving on 50 level, the Stochastic is showing downward momentum and the MACD line is below the signal line in the negative territory. The ADX is showing sell signal. The indicators are showing downward pressure while USJPY has almost reached the lower Bollinger band. 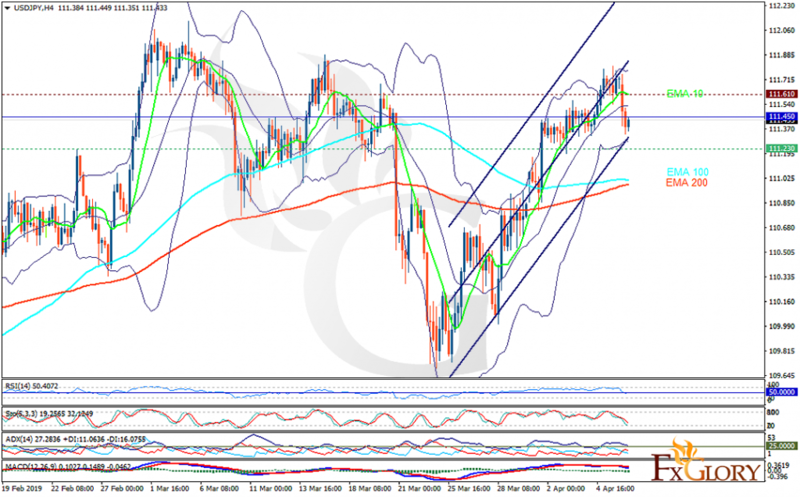 The price may continue its bearish trend towards 111.20 but then buyers can target 111.650.